carriewriterblog: How Much Backstory Do You Need to Complete the Picture? How Much Backstory Do You Need to Complete the Picture? Over the holidays, I finally got my chance to see the entire "Casablanca" from start to finish. I had only seen parts of it over the years on television, and while I knew the infamous music and the basic storyline, as well as all the famous quotes - here's looking at you, kid -- round up the usual suspects -- it was quite different seeing the whole thing in a revival movie theatre. 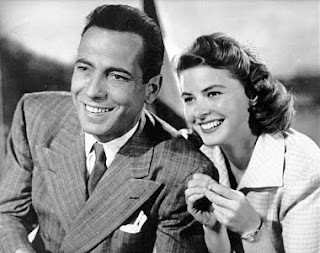 I was surprised that about halfway through, the filmaker took us through about a half-hour backstory expose of the love story between Bogart and Bergman, and their romance in Paris before the German occupation of Paris in WW2. The flashback was perfect. It showed the intense romance between the two main characters, the events leading up to the spread of the war, the key moments that captured everything we needed to know about the affair. There was not a single unecessary detail or extraneous moment in the entire sequence, and the transitions before and after were seamless. So, I got to thinking about flashbacks and backstory, and how important they are to telling your story when done right. In many ways, they must have all the qualities of good writing to begin with. There should be something urgent about them. They should contain important details that move the plot forward and expand the depths of the characters. I thought about other great moments, and humorous ones as well, like those scenes in Woody Allen's "Annie Hall," when we see flashbacks to Alvy's youth growing up next to the Cony Island roller coaster screaming at the family dinner table, juxtaposed with Annie's conservative household. I also remembered reading about how in the making of "The Big Chill," director Lawrence Kasdan had originally planned a flashback sequence at the end of the film to show the characters' college lives together, and then decided to leave it out, realizing that the story was complete without it. And what about books? Who can forget the classic example of "Rebecca" by Daphne DuMaurier, the story of a marriage told entirely in flashback; or, "A Christmas Carol," where Scrooge's past is used to explain his current character and foreshadow his grim future should he not change. The dreaded "flashback" sequence as a cliche, is something all novice writers are adamantly warned against doing. Start off a story that way and you're guaranteed to lose your audience. However, that does not mean that both in fiction and business writing, you neglect to "fill in the blanks" for your readers. Some of the best books ever written and films ever made include key flashback scenes that are so well done, they provide just that missing information needed to make the story complete for readers and viewers. In fact, many marketing specialists suggest that we tell our stories when speaking in public and writing our "About" pages for our blogs and websites, because they are part of our brand, and set us apart from others. Also, they allow our audiences to identify with us and make a connection. This enhances the relationship, and inspires trust. And in the end, we want to do business with those we trust, right?